Dedicating the electric vehicle charging station in Condon are, from left, Condon Mayor Jim Hassing, Columbia Basin Electric Cooperative Director Roy Carlson, CBEC staff member Josh Coiner, CBEC staff member Debbie Lankford, Gilliam County Judge Steve Shaffer and Condon Chamber of Commerce Executive Director K’Lynn Lane. 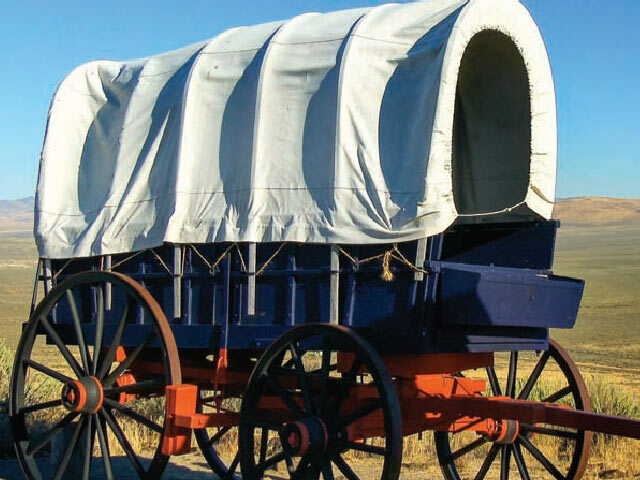 The territory served by Columbia Basin Electric Cooperative is formerly a land of pioneer wagons pulled by oxen, and mule teams making their way west in the 1800s. In 2016, there is a different kind of trailblazing taking place, this time without wagon ruts, and certainly a lot faster. Because of some out-of-the-box thinking, CBEC’s remote territory is now accessible to electric-powered vehicles— an unlikely outpost for those who prefer a plug to a fuel pump—and is another sign technology is popping up where you least expect it. CBEC serves more than 3,500 meters in five Eastern Oregon counties, their towns full of classic examples of frontier architecture, located on spectacular scenic byways with rolling wheat fields. Drivers traveling these lonely roads never fail to be impressed by the area’s natural beauty and friendly residents, but many tourists bypass the area entirely. This is particularly true for those traveling in electric vehicles. They have had no choice but to avoid the area because of the absence of charging stations. 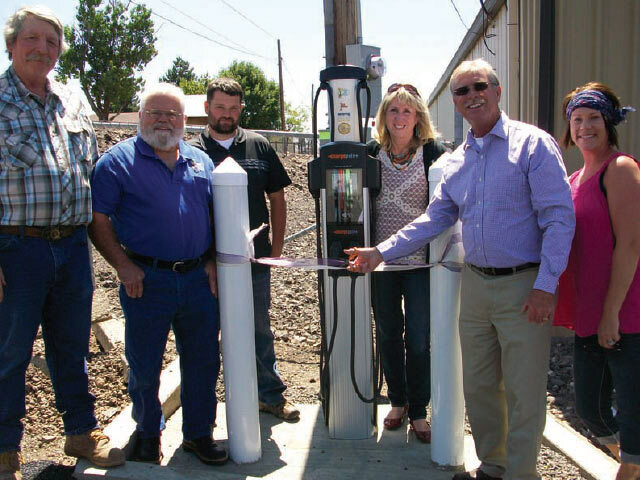 The charging station in Ione is one of four recently installed in Columbia Basin Electric Cooperative territory. 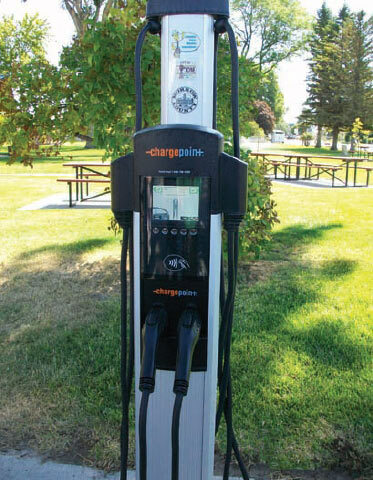 This spring, CBEC leaders decided to roll out the welcome mat by investing in electric vehicle charging stations in Ione, Condon, Heppner and Fossil. If the idea seemed out of left field for a remote Eastern Oregon electric cooperative, it was at least a nod to those who had come before them. “We’re a different kind of pioneer,” said CBEC’s Debbie Lankford, who helped spearhead the project. Like all pioneers, there was the fear of the unknown as they began their journey. After the seven-member Columbia Basin board voted to proceed with the project, CBEC Manager Tommy Wolff brought the idea to local community and government leaders, making individual presentations to the four communities. He was unsure of what he would find. It was so powerful that various entities helped chip in more than $10,000 for the $56,074 project cost. The state’s renewable energy tax credit also helped offset the project’s cost. With enthusiastic community support backing their effort, Columbia Basin leaders set a self-imposed Independence Day deadline for completion, leaving only two months to pull all the disparate pieces together. The electric cooperative partnered with ChargePoint, which designs, builds and supports what it calls the world’s largest and most open EV charging network. It was an ambitious deadline. There were electrical permits to acquire, training to complete, and tests to run to ensure the units were able to communicate with the internet via local cell towers. The four charging stations were in place with three days to spare before the local July 4 celebration. While the charging stations were not overwhelmed with activity, CBEC leaders were pleased they met their objective. They are now working with Oregon’s tourism arm, Travel Oregon, to help get the word out to a burgeoning electric vehicle community. Lankford said there are various ideas being discussed, such as a passport challenge to entice Oregonians to tour a place not normally on their bucket list. There are ample reasons for anyone to visit. Heppner, for instance, calls itself the “Gateway to the Blues,” the commercial and recreation center for the nearby Blue Mountains and Umatilla National Forest. The region is a popular destination for hunting and winter sports, but Heppner also promotes tourism for niche activities, such as bicycling. The charging station in Fossil gives electric cars access to one of Oregon’s 7 Wonders: the famed Painted Hills that are part of the John Day Fossil Beds National Monument. Columbia Basin’s Debbie Lankford said the co-op seeks to blend its Old-West heritage and new technology. “We’re a different kind of pioneer,” she said. Condon, in Gilliam County, has a downtown area listed on the National Register of Historic Places, and is becoming a haven for various car clubs. Columbia Basin’s investment in the charging stations has an economic development component as well. The charging stations are located strategically near restaurants and local shopping so visitors can bide their time and support local businesses while their vehicle is charging. They may not be the economic silver bullet that rural communities seek, but Wolff said the project reflects how local communities understand they need to keep up with the times. Now, they wait, knowing there will be no rush of electric vehicles into their service territory. But they also know their history. The first visitors west in the 1841 came in a trickle, when a small band of 70 pioneers left Independence, Missouri. That number hit 1,000 two years later. And they kept coming. Columbia Basin is confident that word will spread through Travel Oregon, Drive Oregon and websites such as Plugshare that let electric vehicle owners know of available charging station locations. But there is also a sense that no matter how many vehicles drive up to their stations, it has been a worthwhile effort to rally their communities to bridge the rural-urban divide and showcase their part of Oregon. “The outreach has definitely been beneficial,” said Roy Carlson, a retired federal employee who serves on the Columbia Basin board. Wolff agrees with this assessment. “We’ve got a lot of mileage out of this already,” he said with a smile.